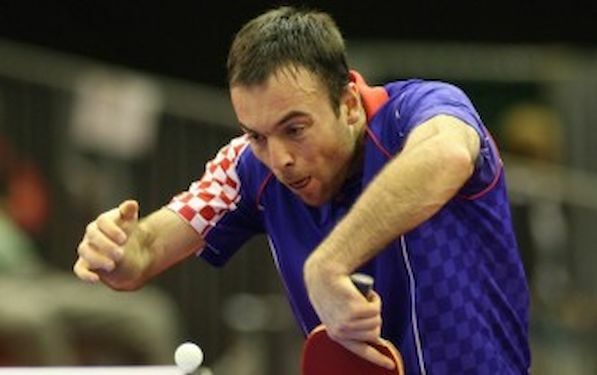 Roko TOSIC, the no.7 seed exceeded his rankings and reached semi final of the Men’s Singles Event at the 2013 ITTF World Tour, Zagreb Open, Euro Africa Challenge Series. In front of the home crowd in the quarters he overcame Germany’s Benedikt DUDA. For the place in the final he will play against Jon PERSSON of Sweden who overcame Jonathan GROTH of Denmark in seven games. However DUDA did not left the field without great fight. He recovered from 0:3, leveled, but failed to stay at the same course. Abdel-Kader SALIFOU of France, the no.6 seed progressed to the penultimate stage after victory over Lubomir PISTEJ of Slovakia. His adversary in tomorrow’s semis will be Janos JAKAB of Hungary. Janos also needed seven games to book his place among best 4. Two Korean and two European players will fight for the place in the final tomorrow in the Women’s Singles Event. Slovak Republic’s Barbora BALAZOVA stretched Swede Matilda EKHOLM to full distance in the quarterfinal, but in the decisive game, Matilda showed she can cope with pressure. In another full distance match Croatia’s Lea RAKOVAC, the no.13 seed who already overcame Alexandra PRIVALOVA of Belarus, the no.6 seed, failed to produce another upset. Korea’s KANG Haneul prevailed after 10:12 in the seventh game. Her compatriot LEE Dasom accounted for Sofia POLCANOVA of Austria. Thomas LE BRETON of France clinched the title in U21 Boy’s Singles Event. he beat his compatriot Mehdi BOULOUSSA in five games in final. Sofia POLCANOVA secured the title in U21 Girls Event. She beat Barbora BALAZOVA in straight games in the final.